The Association du Salon du Dessin now organizes every year, at the same time as the Salon itself, a scientific colloquium which brings together the outstanding specialists in the field. After two editions devoted to collector artists, the theme of the 2008 program was drawings by sculptors. The proceedings, recently published, present eleven fascinating contributions. The most interesting work revealed in this volume is the very rare category of drawings executed directly on a wall. It is a charcoal representation of two large winged figures holding an inscription. By comparing it to the preparatory studies by Bouchardon for the monument for Pope Clement XI Albani (ill. 1), but never completed, the author attributes it very convincingly to this artist. Located under the attic of the Palais Mancini, which in the 18th century was in fact the Académie de France in Rome, it was produced by the young artist on the wall of his room. The building has changed totally since that time and the rooms no longer exist. Discovered in 1969, but at the time hastily attributed to Natoire, this monumental drawing is much more visible today. Several essays study little-known holdings, some even totally unpublished. 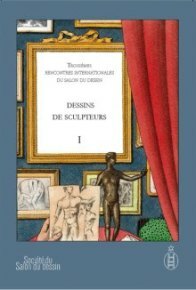 Geneviève Bresc-Bautier thus reveals a collection of drawings from a family of French sculptors of the 16th and 17th centuries, the Normains. Owned by the Bibliothèque Mazarine, it also includes many sheets by other sculptors. 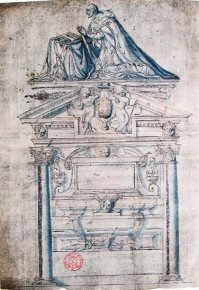 Although a good number of them have not yet been identified, thus opening a rich research field for scholars, the article presents others, such as the first project for the tomb of Cardinal Birague by Germain Pilon (ill. 2). Another still unpublished workshop holding is that of the Italian sculptor Giovanni Battista Maini which Jennifer Montagu told us about in an interview, last year. Most of his drawings are held in Malta, in two separate collections, and probably come directly from his workshop. Peter Furhing presents drawings by 18th century silversmith-sculptors found in different collections, notably at the Bibliothèque nationale de France. He examines the conditions for elaborating the silversmith work and the role of studies on paper in their conception. He points out the differences between, notably, workshop drawings and those for presentations, these often being the only ones still preserved as the former were considered only work sheets, not meant to be kept. In his talk, Guilhem Scherf also looks at the workings of drawings by sculptors. He publishes several sheets for the first time which are preparatory for either engraving or the execution of a copy of an Antique, at times even without any direct relation to a sculpture. Like in the interview he gave us, in French, he wonders about the difference between the drawings by sculptors and those by painters representing sculptures. He concludes with the idea that the sculptor’s true drawing appears in the clay itself. Much as Anne-Lise Desmas, Edouard Kopp studies Bouchardon’s work by means of his drawings for the Trevi Fountain, which, as we know, was finally produced by other sculptors from a project by Nicolò Salvi. He draws very pertinent conclusions as to how the research for the Roman monument would influence the design of the Grenelle fountain in Paris. English sculptors, with a short study on the drawings of Joseph Nollekens (by John Kenworthy-Browne), and German ones with an article by Bernhard Maaz on works by Neo-classical artists (essentially Johann Gottfried Schadow) are also included. After studying a notebook by David d’Angers held in his namesake museum (by Erika Naginski) and a contribution by Antoinette Le Normand-Romain on the preparatory studies for the genesis of Rodin’s Gates of Hell, the volume closes with a look at the relations between Picasso and Julio González, since the latter worked as an assistant or “praticien” for the Spanish artist thus encouraging his career (article by Brigitte Léal). As in previous years, the proceedings are published in a very pleasant format which is easy to use. There are many illustrations ; however, it is too bad they are not included in the text but placed at the beginning for color plates and at the end in the case of the black and white pictures, at times in a size that is almost too small. Finally, we would like to point out that the fourth international encounters of the Salon du dessin, which will take place on 25 and 26 March, will pursue the exploration of this theme with a program which is just as eclectic as the last. Guilhem Scherf (ed. ), Dessins de sculpteurs. Troisièmes rencontres internationales du Salon du Dessin, Editions de l’Echelle de Jacob, 2008, 206 p., 35€. ISBN-EAN13 : 9782953325706.